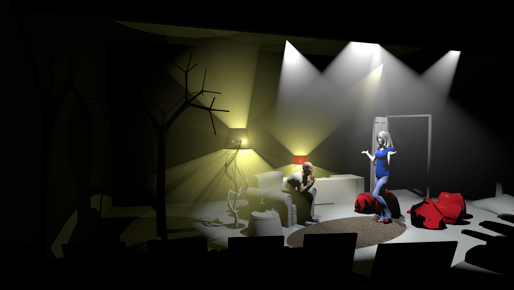 First foray into Theatre Set Design. Joseph Hodges' simple set, Shaun Duke's sound design and Derrick McDaniel's lights conjure the glittering northern landscape and the aurora borealis so persuasively that when I left, dreaming of icy air and hot cocoa, I was taken aback to find myself on Santa Monica Boulevard. Production designer Joseph Hodges has created a magical white-on-black world whose night sky sparkles with countless stars in a gorgeous multi-local set, and though scene changes could stand some speeding up, sound designer Shaun Duke Jr. thankfully provides just the right moody musical underscoring as actors maneuver set pieces between scenes in addition to supplying requisite sound effects throughout. Derrick McDaniel’s lighting is one of the accomplished designer’s best, with Maine’s Northern Lights offering up a recurring “light” motif throughout. Brittnay Davidson’s character/climate-perfect costumes and myriad of props complete the production design to perfection. The elegant black and white set by Joseph Hodges features a snowy landscape, complete with frosty, abstract trees and twinkling stars, within which all the other sets are placed. 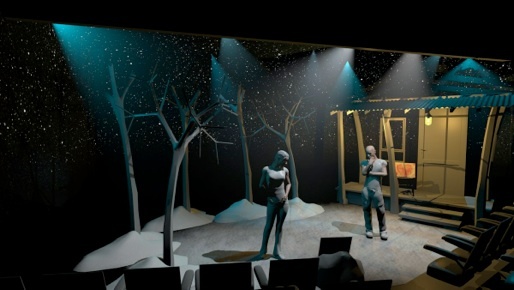 The scenic design (by Joseph Hodges) is surreal and simple, but very effective in furthering the story. 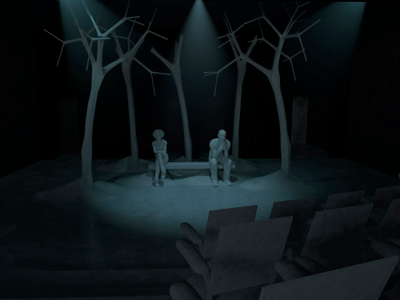 The white, industrial-style trees and sparkling black curtain create the magical world of Almost, Maine. 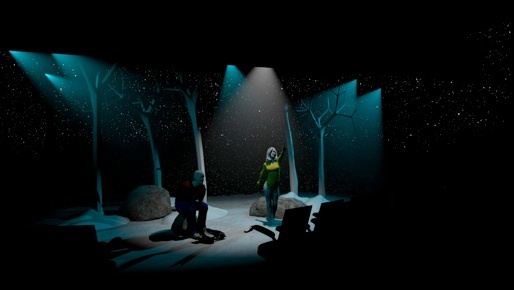 Additionally, the use of lights on the fourth wall creates the mystical northern lights. Lastly, the sound design (by Christopher Amitrano) uses transition songs that make each scene change subtly as part of the storytelling.